This is an old revision of this page, as edited by Praemonitus (talk | contribs) at 15:10, 25 September 2017 (Absolute mag. with ref.). The present address (URL) is a permanent link to this revision, which may differ significantly from the current revision. For other stars with this Bayer designation, see ξ Sagittarii. 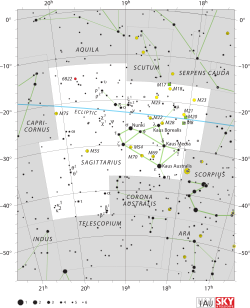 Xi2 Sagittarii (ξ2 Sagittarii) is a star in the zodiac constellation of Sagittarius. Data collected during the Hipparcos mission suggests it is an astrometric binary, although nothing is known about the companion. It is visible to the naked eye with a combined apparent visual magnitude of +3.51. Based upon an annual parallax shift of 8.93 mas as seen from Earth, this system is located around 370 light years from the Sun. The spectrum of Xi2 Sagittarii yields a mixed stellar classification of G8/K0 II/III, showing traits of a G- or K-type giant or bright giant star. It has an estimated 3.36 times the mass of the Sun and about 14 times the Sun's radius. At an age of around 380 million years, it is radiating 676 times the Sun's luminosity from its photosphere at an effective temperature of 4,541 K.
^ a b Houk, Nancy; Smith-Moore, M. (1978), Michigan catalogue of two-dimensional spectral types for the HD stars, 4, Ann Arbor: Dept. of Astronomy, University of Michigan, Bibcode:1988MSS...C04....0H. ^ a b Pasinetti Fracassini, L. E.; et al. (2001), "Catalogue of Apparent Diameters and Absolute Radii of Stars (CADARS)", Astronomy & Astrophysics (3rd ed. ), 367: 521–24, arXiv:astro-ph/0012289, Bibcode:2001A&A...367..521P, doi:10.1051/0004-6361:20000451. ^ a b McWilliam, Andrew (December 1990), "High-resolution spectroscopic survey of 671 GK giants. I - Stellar atmosphere parameters and abundances", Astrophysical Journal Supplement Series, 74: 1075–1128, Bibcode:1990ApJS...74.1075M, doi:10.1086/191527. ^ "ksi02 Sgr". SIMBAD. Centre de données astronomiques de Strasbourg. Retrieved 2017-07-05. ^ Frankowski, A.; et al. (March 2007), "Proper-motion binaries in the Hipparcos catalogue. Comparison with radial velocity data", Astronomy and Astrophysics, 464 (1): 377–392, arXiv:astro-ph/0612449, Bibcode:2007A&A...464..377F, doi:10.1051/0004-6361:20065526. ^ Makarov, V. V.; Kaplan, G. H. (May 2005), "Statistical Constraints for Astrometric Binaries with Nonlinear Motion", The Astronomical Journal, 129 (5): 2420–2427, Bibcode:2005AJ....129.2420M, doi:10.1086/429590.